Rohit Sharma, Shikhar Dhawan and Ravindra Jadeja will be taking part in the pink ball Duleep Trophy final next week, before the New Zealand Test series starts on 22 September. 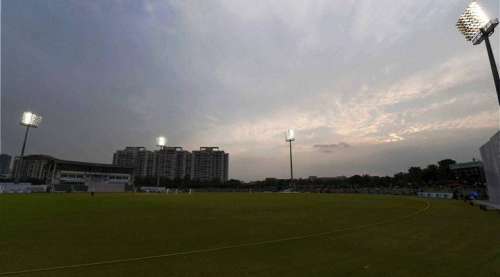 Other India hopefuls who will be participating in the match are Amit Mishra, Cheteshwar Pujara and Stuart Binny. There are three other opening options who will be participating in the match – veteran Gautam Gambhir, Mayank Agarwal and Abhinav Mukund – with slots in the Team India batting order still to be fixed. "All India senior selection committee announced the India 'Red' and India 'Blue' teams for the Paytm Duleep Trophy Finals to be played at Shahid Vijay Singh Pathik Sports Complex, Greater Noida, Uttar Pradesh from September 10 to September 14, 2016. The teams were revised in due consultation with the Indian Team Management while preparing for the forthcoming season," BCCI said in a media release on Wednesday. The final match of this year’s historic Duleep Trophy will be played between Yuvraj Singh-led India Red and Gautam Gambhir-led India Blue. Suresh Raina’s India Green lost to India Red by 219 runs and are being comprehensively outplayed in the ongoing match against India Blue. The BCCI has been stressing for a long time that the pink ball Duleep Trophy tournament would be used to test whether the pink ball format of the game can be held in India. They had repeated many times that the biggest India players, including MS Dhoni and Virat Kohli, would be participating in the tournament as part of the exercise to test the feasibility of the experiment. However, while Dhoni opted out owing to the fact that he does not play the longer format any more, Kohli also asked to be rested, keeping in view the long international Test season ahead. The frontline India bowlers have also been exempted from appearing in the match, with Mishra being the only bowler in the match who will be expected to make the Test squad. India Red: Yuvraj Singh (captain), Abhinav Mukund, Shikhar Dhawan, Sudip Chatterjee, Gurkeerat Singh Mann, Ankush Bains (wicketkeeper), Stuart Binny, Akshay Wakhare, Kuldeep Yadav, Amit Mishra, Nathu Singh, Anureet Singh, Ishwar Pandey, Nitish Rana, Pradeep Sangwan. India Blue: Gautam Gambhir (captain), Mayank Agarwal, Rohit Sharma, Cheteshwar Pujara, Siddhesh Lad, Dinesh Karthik (wicketkeeper), Parvez Rasool, Suryakumar Yadav, Karn Sharma, Ravindra Jadeja, Mohit Sharma, Pankaj Singh, Abhimanyu Mithun, Sheldon Jackson, Hanuma Vihari.